Painting bold statements across vacant Detroit structures is a growing trend to get a controversial point across, and this new display on the city's west side isn't any different. I was coming off I-96 from visiting family when I passed by this empty home on the corner of Davison and Santa Rosa*. You might recall that empty houses off the well-traveled Davison Freeway are a hot spot for eye-catching expressions of the devastating economic changes wrought upon this area. I pass by this two-story bungalow quite a bit and it's been boarded up for awhile now, but last night I noticed the boards in the front were painted burgundy. Leaning in closer, I saw the message loud and clear: in yellow "Another family evicted by" on one board, the Wells Fargo logo on the other. I have no idea who lived in this house and exactly how long it has been empty. (According to Wayne County property records, the City of Detroit owns the home; the City of Detroit lists a private owner; neither entity lists the property for demolition or auction.) I don't even know if Wells Fargo held the mortgage on this house. I do know that Wells Fargo catches a lot of heat in the headlines for evictions and foreclosures and there are several Occupy-style actions in protest of the bank. But it goes without saying that the mortgage crisis compounded with economic turmoil (amidst an overall storm of other mishaps in the city) has aided in the blight of several neighborhoods. 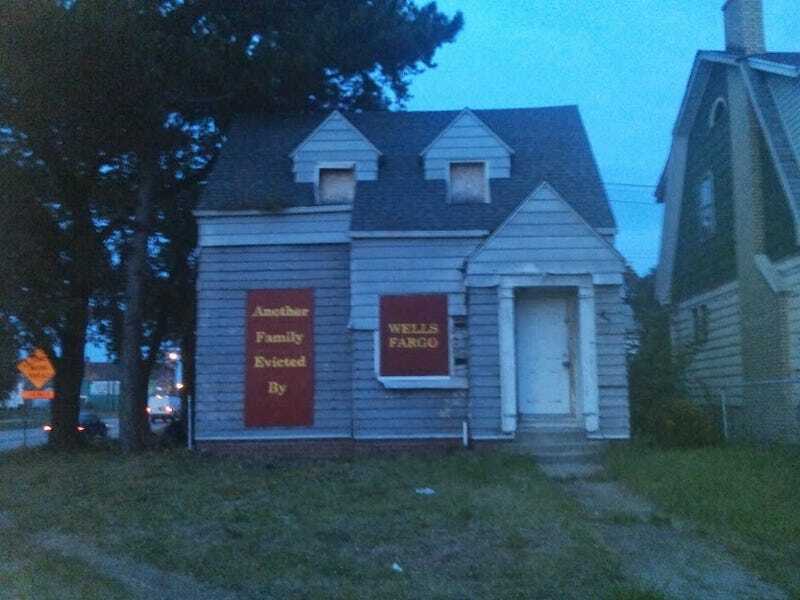 Whether Wells Fargo can take all the blame for this particular home's current state is anyone's guess at this point. Any other anti-big bank signs around town? Tweet me.